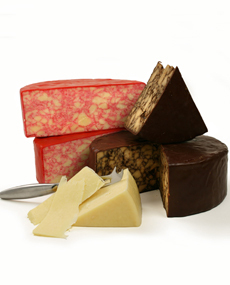  Cahill’s Farm Cheddars get our vote for best-looking Irish cheese. Photo courtesy iGourmet.com. If you don’t have the time or inclination to cook up traditional Irish dishes, set out an Irish cheese board and some Irish beers. You’ll have to hunt for the cheeses (or you can buy them online). Irish artisan cheeses that can be found in the U.S.
Kerrygold cheeses, from the dairy cooperative famous for its Kerrygold butter. Irish beers to serve with the cheese. Serve the cheeses as a munch with apéritifs, beer, cocktails or wine; as a cheese course; or as a dessert course with fruit. Or, snack on Irish cheese and beer as you watch Celtic Thunder, Celtic Woman or your own Irish film festival (start with The Secret Of Kells).